The U.S. bank prime rate remained at 3.25 percent, where it has been for over six years now. This is the longest period ever with no change in the prime rate. With a change in one of the consumer non-rewards credit card offers tracked by this survey, the average rate for that category dropped by 12 basis points to 15.42 percent, and the overall consumer credit card average dropped by 4 basis points, to 17.13 percent. All other categories remained unchanged in February. This was the second consecutive monthly decline in consumer non-rewards credit card rates. What are credit card companies reacting to? A likely suspect seems to be the negative inflation rate. The change in the Consumer Price Index was negative for each of November, December, and January. An overall decline in prices means that credit card companies can earn wider profit margins on the interest rates they charge, leaving some room for rates to fall. However, consumers looking for lower credit card rates should not bank heavily on deflation to lead to a widespread decline in rates. For one thing, rate reductions have been very selective rather than broad-based. Also, deflation is not generally the norm, and already the direction of prices may have started to reverse. The decline in consumer prices has been heavily influenced by the plunge in oil prices. The price of a barrel of oil dropped by more than $50 a barrel over the second half of 2014, and the decline continued in January. However, oil prices appear to have firmed in February, which may spell the end of recent incidents of deflation. Notably, Treasury yields and mortgage rates have begun to rise in recent weeks, which may reflect higher inflation expectations. Whether prices rise or fall, the surest way for consumers to get lower credit card rates is to shop around for them, rather than waiting for an industry-wide reduction in rates to affect their current credit cards. With the decline in consumer credit cards coming in the non-rewards category, the rate spread between non-rewards and rewards credit cards widened. The change in rates widened this spread by 12 basis points, to 2.45 percent. That is the widest the spread between rewards and non-rewards cards has been since June of 2013. A wider spread raises the potential relative cost of participating in rewards programs. However, consumers can counteract this trend by making sure they get full value out of those programs, and especially by paying credit card balances off in full every month so they do not pay interest. 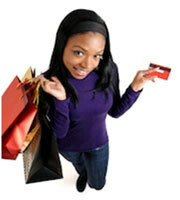 The average interest rate for student credit cards remained at 17.04 percent, where it has been since year end. Rates on both categories of business credit cards remained unchanged in February. Business rewards rates have not changed since early December, while business non-rewards rates have not changed since last October. The change in consumer credit card rates occurred in one of the upper rate tiers, which are charged to customers with less-than-perfect credit. This reduced the spread between the lowest rates (those available to customers with excellent credit) and the overall average by 4 basis points, to 4.06 percent. That change runs counter to a trend that had seen the spread widen by 17 basis points since the beginning of 2014. It will be interesting to watch whether this latest move is just an aberration or the beginning of a new trend. 0 Responses to "Consumer credit card rates improve in February"